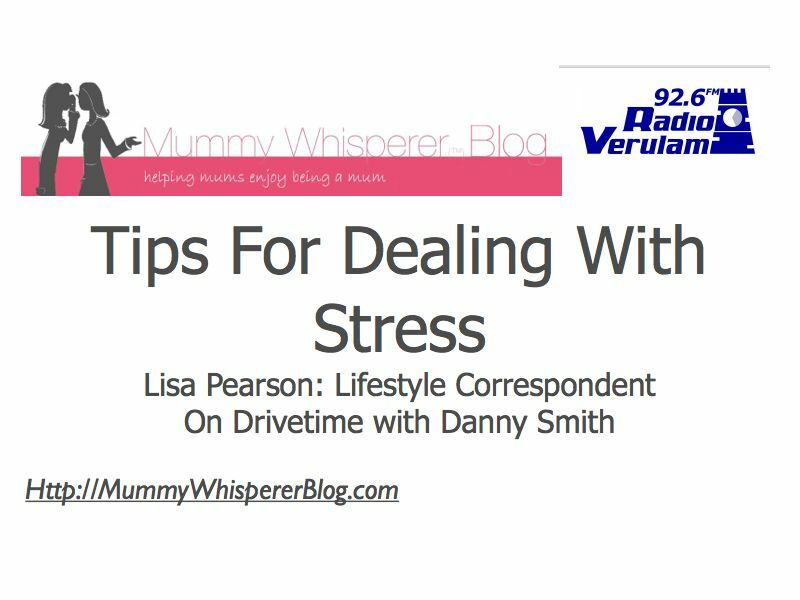 So last months LifeStyle feature with Radio Verulam and the lovely Dapper Danny Smith on his Drive Time show was all about stress. Sorry for the delay in posting it, my life has been a bit stressful!! The big question is, when should you do something about being stressed and when is it just normal every day stress that goes away? (You can either read it, or listen to the audio at the bottom if you prefer to listen to my dulcet tones!). Life is always going to have it’s ups and downs, and we’ll be disappointed if we think that it’s possible to remove stress or difficulties from our lives. But what we talked about on the show was the fact that some stress can be healthy and in a weird way enjoyable, whereas long term stress can start to have a detrimental affect on us. It’s when it gets out of hand, and you are either constantly in fight/flight with constant adrenalin or totally shut down. It’s an inbetween place between a difficult day and more complex problems of mental/physical health. So from that perspective it’s a good place; because it’s like a warning sign and opportunity to put things right in your life. I was a massive stress junkie when I worked 13hrs a day, 6 days a week in IT and could easily smoke, drink coffee, nibble my nails, eat chocolate all at the same time; which is why they sent me on a pile of personal development courses and I ended up with my fascination for it. People think I’m pretty calm nowadays, but I do get stressed, maybe I just know more about dealing with it, or getting rid of it, that’s all (or I’m a good faker!). Finances: at the moment is obvious! Being out of control, sticking your head in the sand and feeling powerless with long term financial problems which will take time to resolve is very difficult. Check out my posts about saving/managing your money, especially the last two I did for Radio Verulam on budgeting. Physical pain or problems: This I’ve had lots of experience with for the last 6 months or so and started to understand how very stressful it can be. Especially constant pain for older people or some physical challenge that is stopping you from doing things. Check out my posts on Fibromyalgia for more info. Update: Your body can also come under stress due to allergies, intolerances, over exercise i.e. anything that put’s pressure on it and makes it feel concern for it’s safety or that it is under attack. Work: some people love the stress of work; I love the excitement or nerves of being on radio and used to find it really helpful when I was a trainer in IT. However, you can end up overworking, or underworking or doing a job you don’t enjoy which can be constantly stressful. It does depend on the person though; if I’m bored I’m very stressed, whereas other people would love a job that was less challenging. People: People get everywhere don’t they and they don’t half cause a lot of trouble! Friends, workmates, partners and kids are all potential creators of stress. Holding onto things that have caused you pain/trauma, that will sit in your body and eat at you. Remember, it’s worth letting go because it’s not about them, it’s about the price you pay for still being hurt or upset about something. Doing what other people think you ‘should’ do, can make you very stressed. The good news is that we can’t always change the world around us, but we can change how we see it; so we don’t have to stay stressed. How you know whether you are stressed? People often ignore stress, and that can be wise if short term; I’m not recommending that you become worried about stress as it can be really healthy. After all it’s the stress that raises our adrenalin levels that got us running away from those dinosaurs all those years ago, and now keeps me on the ball when I’m doing something scary like a radio show! But one sign that it needs looking at is when it is long term with no let up (i.e. more than a few weeks or months). There will be also be an obvious hint because your family/friends/body will tell you. They’ll either be getting grumpy with you or if you’re lucky they’ll sit you down with a cuppa/glass of wine and ‘give you a good talking to’. Your Body will either keep getting sick or ill or give you stomach cramps. It will keep giving you warnings and when you don’t listen it keeps upping the ante so that you listen to it. (It’s trying to be helpful, even if we don’t see it that way when we have a headache!). As the stress kicks in we become more worried, have memory problems, become indecisive, our thoughts start to control us, we have less rest, our brain going constantly, we get moody, isolated and start to feel helpless. So don’t ignore stress as ‘just one of those things’. It’s not ‘one of those things’. It’s a sign that a change of some sort is needed, or at least a plan for a change. Look after yourself when you are stressed, and don’t let it turn into a full blown illness or depression. I’m a good example of ‘cobblers shoes’; I’ve been pushing myself just a little too far, for just a little too long, because I’ve always been able to cope. But I didn’t make the time to go to Pilates or rest and my body is well and truly telling me off about it. When we don’t reduce the stress it becomes a cycle where we eat worse, drink more alcohol/caffiene, eat more chocolate, go to bed later, and then pull away from friends who would be able to help us and become isolated. So we get more stressed! This is the great place to start because if your body is happy, your emotions will be steadier and you’ll have more energy. From there you will be able to tackle your problems more easily. Exercise 3 times per week even just for a brisk walk, get some fresh air, get a little out of breath even if it’s just 15 mins per day. This isn’t about becoming a Triathlete, this is about having some fun and rejuvenation. Eating healthily (there’s loads of information on my blog about healthy eating, even if you are a rubbish cook like me!) has an AMAZING affect on us; never underestimate the power of nutrition to make a change in our lives. Supplements are a great way to support your body; probiotics for your digestion, Omega oils for concentration, Vitamin D if you miss the sunshine. Drink water, have a habit like drinking a glass whenever you brush your teeth or come back in the house. Remember your body is like a car which won’t work without oil; we don’t work without water. Sleep; start following a regular repeatable sleep pattern and stick to it! Now it’s time to calm those brains down. (We’ll come back to ways of letting go of your problems, pains and hurts another time when we have more time). Each night Count 3 blessings a night; it’s a great way to go to sleep and I promise you that you will have 3, even if it’s just a good cup of coffee or a sunny day. Go on a complaining diet and stop talking about the stuff you don’t want or like in your life. Seriously, no talking about the horrid stuff, no thinking about it, you are totally banned unless you are sitting down with someone to make a plan to change it. Write down your problem; either just once to find a solution to your issue or every morning as recommended by Julia Cameron in her book ‘The Artists Way’. Check out my favourite books that can help when you are overwhelmed or depressed. There are so many more things that you can do to reduce the stress, that we are going to have to come back to this subject at some point in time! But I hope that this gives you a good starting point. If you’re a Mum (or Dad) then you might like to check out my Kindle book (you don’t need a kindle to read it) for just 99p as well. In the meantime remember that ‘this too shall pass’. Thanks for these tips ,i’m now the proud owner of your book which I feel is beneficial for even those of us who aren’t Mums! This week I hit major stress due to one of my longtime addictions: rushing. I’m in the midst of writing about this very powerful stress inducer because it really woke me up this week, just how much rushing goes on and how a cluttered home can simply cause chaos and greater stress. Hi Grace, ooh I’d love any feedback you have on my book as my second edition has been delayed, so I have plenty of time to make more changes! Ahhh rushing – that one is easy as a Mum, because the kids ALWAYS kick off when I rush. They have some kind of internal sensor that says ‘oooh Mummy really needs me to be well behaved, so I must teach her that rushing is unproductive and have a MEGA Meltdown!’.